When Bolivian Foreign Minister David Choquehuanca and U.S. Assistant Secretary of State Arturo Valenzuela met at the beginning of the month, it appeared that relations between the US and Bolivia were on the verge of being normalized following an 18-month diplomatic chill. Choquehuanca announced to the press that "the two sides are 99% done with a pact that would allow the exchange of ambassadors." President Evo Morales declared his own hope that the two countries would now "advance with this new framework agreement for full diplomatic, trade and investment relations." But hope for improved relations appeared to be dashed two weeks later when President Morales angrily accused the US Agency for International Development (USAID) of financing groups opposed to his government. "If USAID continues working in this way," he said, "I will not hesitate to expel them because we have dignity and sovereignty, and we are not going to allow any interference." Some may see Morales' recent statements as evidence that he isn't serious about seeing the agreement with the U.S. finalized and signed and, instead, is more interested in stoking nationalistic sentiment and strengthening his anti-imperialist image among his supporters. However, it is worth noting that Morales' latest statements are consistent with criticism that the Bolivian government has directed at USAID since at least 2006. 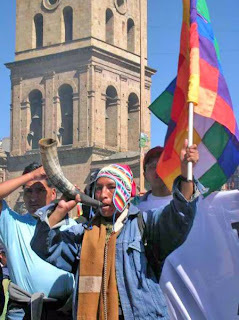 Declassified documents uncovered by investigative journalist Jeremy Bigwood through the Freedom of Information Act (FOIA) show that, as early as 2002, USAID funded a "Political Party Reform Project" designed to "serve as a counterweight to [Evo Morales'] radical MAS [party] or its successors." Though USAID has refused to reveal which political organizations have received funding since Evo Morales' election in 2006, the FOIA documents point to possible funding of opposition groups that engaged in violent tactics and sparked an explosive political crisis in September of 2008. Moreover, given the US government's record for funding opposition groups in Venezuela, the country with which Bolivia has the closest relations, it is perfectly understandable that President Morales is deeply suspicious of USAID's Bolivia program. Unfortunately, rather than seeking to assuage the Bolivian government's concerns by lifting the veil on USAID's activities, the U.S. government has systematically refused to reveal all of the programs and groups that are currently receiving funding from the aid agency. As the Andean Information Network has noted, the US government's position violates international norms on cooperation calling for effective joint collaboration between the governments of donor and recipient countries on all cooperation programs. It appears that the total lack of transparency in USAID's activities is the main sticking point - the 1% that has yet to be agreed upon - that is holding up the signing of the framework agreement that will allow for the full normalization of diplomatic relations. It is this issue that Bolivia's top representative in Washington, Ericka Due¤as, refers to in diplomatic terms in the Inter-American Dialogue's June 10 Latin America Adviser when she calls for: "an outline for cooperation to be defined in a transparent way by both states with the goal of preventing future controversies that disrupt the bilateral relationship." Aside from this longstanding issue, the Obama administration has added one more source of tension to the bilateral agenda with its decision to appoint Greenberg Quinlan Rosner Vice-president Mark Feierstein to the position of Assistant Administrator for Latin America and the Caribbean at USAID. Feierstein was a key campaign consultant to the infamous former Bolivian President Gonzalo Sanchez de Lozada (alias "Goni") who fled to the US in order to avoid facing trial for his alleged role in the massacre of dozens of protesters in October of 2003 under his presidency. Feierstein has never expressed regret for having helped Goni become president; in fact, he has said that he is "proud of the role that we played in electing Goni." This unrepentant attitude, combined with the US government's refusal to extradite Goni to Bolivia, understandably has President Morales and other Bolivians fuming. It is clear that USAID's role in Bolivia is at the heart of discussions taking place between the US and Bolivian governments today. If the U.S. administration is sincere in its desire to improve relations with the Bolivian government, it should come clean regarding USAID's political activities in Bolivia and agree to a framework of future relations that allows for full transparency in all of its "cooperation" programs. Finally, if the US administration wishes to stand by its decision to appoint of Feierstein to USAID, it should, at the very least, recognize the controversial character of the nomination while making it clear that Feierstein has ceased to have relations and will not work to promote or defend the interests of Bolivia's most reviled politician, Sanchez de Lozada. Re USAID & CIA (and military and police 'training' programs, see Penyy Lernoux, 'Cry of the People'.